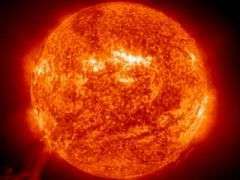 Scientists have published new evidence supporting the recent discovery that the Sun contains about half as much oxygen as previously thought, an issue some scientists have dubbed the solar oxygen crisis. This is a potentially huge scientific problem because scientists have used the particular prior measurement as a platform for understanding the inner workings of other stars. Oxygen is the third most abundant atom in the universe and the element most frequently produced in the “nuclear furnaces” of stars. In many astrophysical situations, oxygen is linked to the abundances carbon, nitrogen, and neon. If the oxygen abundance in the Sun is half as much as scientists thought, these other elemental abundances may also be off by a factor of two. In the April 19, 2007, online edition of The Astrophysical Journal, Socas-Navarro and colleague Aimee Norton, a solar physicist at the National Solar Observatory, discuss how they obtained new evidence for the solar oxygen crisis by using a type of light-analysis device to take measurements of infrared and visible light radiating from a patch of the Sun. The device, known as the Spectro-Polarimeter for Infrared and Optical Regions (SPINOR), attaches to a telescope; in this case, the Richard Dunn Solar Telescope located in Sunspot, New Mexico. The telescope collects the light and sends it to SPINOR, which analyzes its properties. Because atoms in the Sun emit light at very specific wavelengths, the researchers can calculate the abundances of various elements by measuring the wavelengths of light rays coming in. Analysis of the SPINOR data produced a value of the oxygen abundance that agrees with calculations by other research groups studying the solar oxygen crisis. The measurement contained larger-than-expected uncertainty. “This measurement is more uncertain than we thought it would be, which is one of the interesting conclusions of our particular work,” said Socas-Navarro. He added that there is another major downside of a lower oxygen abundance. Models of the solar interior once predicted that sound waves in the Sun traveled at certain speed, a value that agreed well with the measured speed. Because the speed depends on composition, this is another way that scientists learn about the processes that take place in the Sun, what elements it is made of, and in what quantities. Now, with the Sun having half as much oxygen, carbon, nitrogen, and neon, the sound speed derived from the models doesn't match the measured speed well. “Exactly what this means is not very clear, but it casts doubt on the correctness or at least the accuracy of models of stellar interiors, which are a cornerstone of modern astrophysics,” he said.